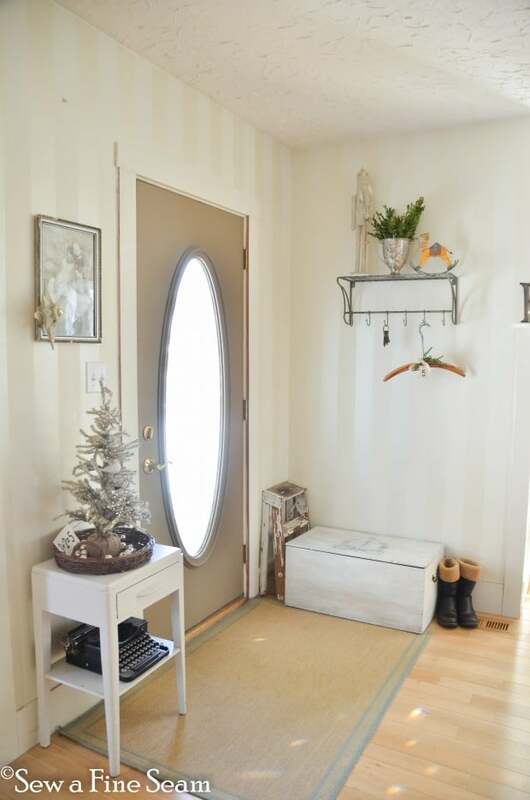 I did want to give you a quick tutorial on how I glittered the Nutcracker I have in my entryway. I was going to take pics and show you each step in a pictorial tutorial but I just haven’t had the time. So I’m going to show you the before pics and the after pics and tell you how to do it – it’s really very simple. This is how they began their life. 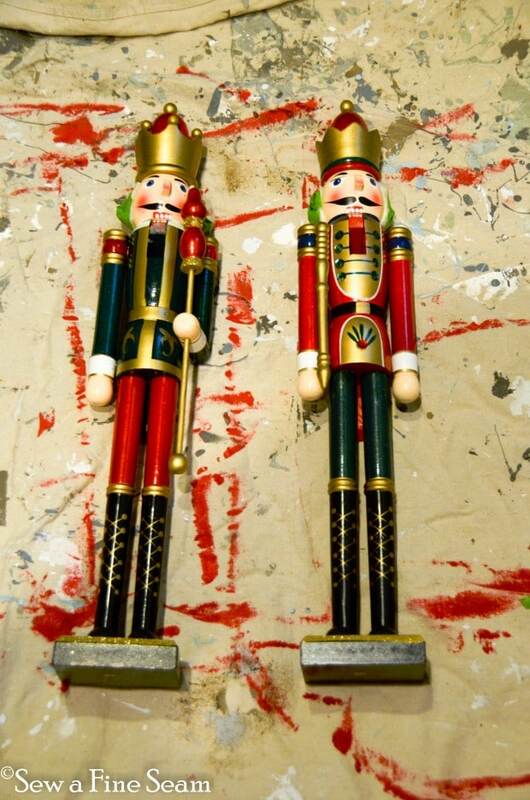 Brightly painted in primary colors – traditional Nutcrackers. Don’t they look so cute against my well-used drop cloth? I spray painted these 2 white. I was not impressed with the spray paint. It was supposed to be some new stuff that worked as a primer and paint all in one. Not so much in my opinion. It took way too many coats to get them covered and honestly they weren’t completely covered at that. The first one I did before these 2 I used Annie Sloan Chalk Paint. That worked wonderful but took a long time to brush on. 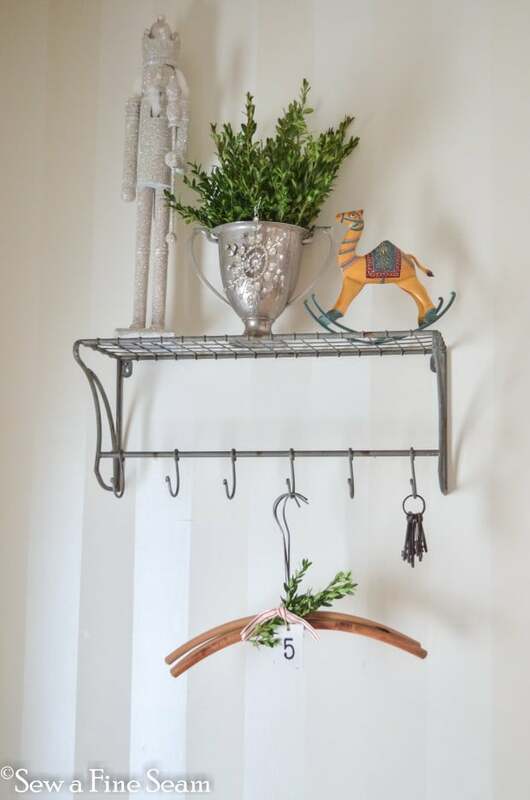 If you want to spray paint some of these for yourself use Rustoleum spray paint – I will never deviate again – just pay the extra price for the good stuff. After the white paint is dry it’s time to cover him with glitter. I used German Glass Glitter because it’s my favorite and I love how it ages to a dark antique look. You can buy German Glass Glitter on Etsy. I used E6000 glue – you can buy it Jo-Ann Fabrics or any craft store. I used an artist’s brush to put the glue on – just painted on an area of glue and then shook glitter over it. I used a piece of paper under where I was working so I could easily dump the extra glitter back in the bag to be used again. You could use Elmer’s school glue for this project – Elmer’s would be easier to spread with a paint brush! If you use the E6000 plan to throw your brush away when you are finished – it will be ruined. You will not be able to wash out the glue that is in the brush and it will harden completely stiff. 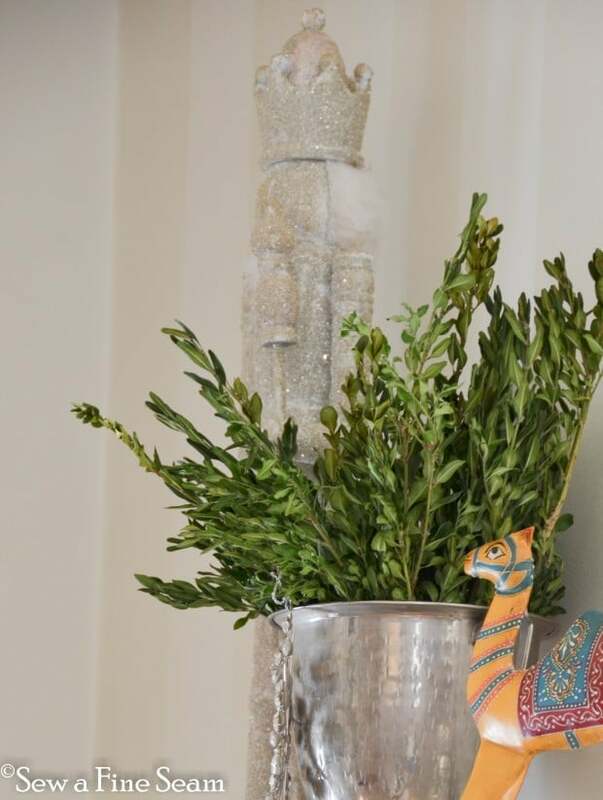 I love how tall and thin these Nutcrackers are and the glitter just makes them a bit different from all the others out there. I love the glass glitter! I love nutcrackers! I have six 🙂 All different and fun. As you can tell I’m quite behind in reading some of my emails. Takes me awhile to get them read then if I need to comment it takes even longer. I love what you did to nutcrackers. I’ve got to do that next year. Wonderful idea, never thought of painting them white then glittering. Smarty pants. I love that glass glitter, have got to get some someday. I keep forgetting until I see somebody has used it then I forget again. Love how your nutcracker looks, hope I remember to do this. 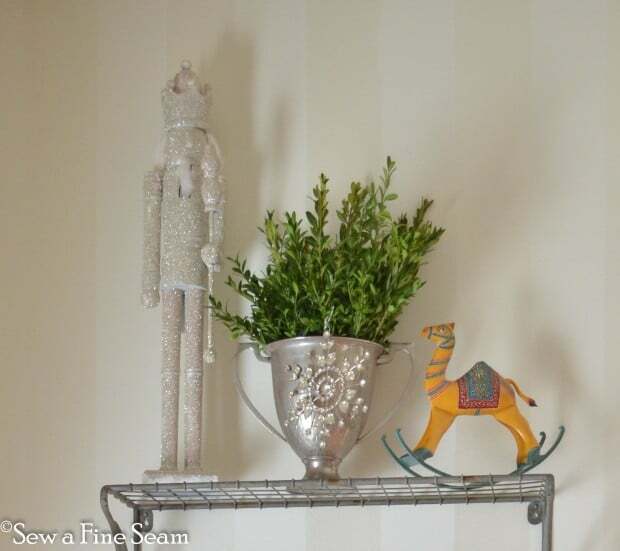 I have some nutcrackers I bought at a decorator store in Bowling Green, KY when we lived there, loved that place. Hmmm, wondering if I got rid of nutcrackers to the thrift store last summer when I was purging big time. Happy New Year. this is the challenge so many of us face. did I get rid of something when I was purging big time ? this is something we are about to face with all the NY restructuring organizing resolutions.